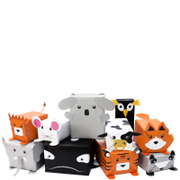 The Animal Gift Wrap will allow you to wrap presents in a fun and creative way, so your gifts look extra special. Simply wrap the present in the plain paper, then use the stickers and cut-out sheets to add all the other details, such as the tail, ears, eyes and feet. The pack comes with a step-by-step guide which will tell you how to make 24 different animals, including a lion, elephant and a koala bear. - L.M. Features: 6 x sheets of plain wrapping paper 8 x sticker sheets 5 x cut-out sheets Step-by-step guide tells you how to make 24 different animals Use the plain paper to wrap the gift, then use the stickers and cut-out sheets to add the extra details Please Note: Glue, sellotape and scissors are not included.